December 25, 2002: The ARRT is pleased to announce that it has received a $5,000 donation from the Intel Corporation's Massachusetts Division, headquartered in Hudson, MA. The grant was made through the Intel in the Community program and will be used for project related work in 3 communities. Specifically, ARRT will be distributing $1,000 to the Town of Maynard for expenses related to the Maynard right-of-way acquisitions. In Hudson and Marlborough, the funds will be used to build and install the first 2-3 trailside information kiosks. 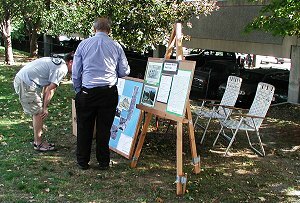 Additionaly, Intel Community Volunteers will assist in the first kiosk's installation, this Spring in Marlborough. November 9, 2002: ARRT volunteers turned out for the 2nd annual trail cleanup. Using equipment supplied by the city, the 3/4 mile paved Marlborough section was trimmed, cut and raked. The weather was sunny and 70! November 8, 2002: The 1/2 mile "Hager Hill" section of the trail received its first asphalt layer this week. The 2nd and final layer should be down by December 10th and construction finished by December 31st. The official opening of this section should be in the Spring of 2003. At that point, there will be a 1.25 mile length of trail open to use. October 28, 2002:Article 5 on the Maynard Special Town Meeting warrant passed! This was to increase the level of borrowing to allow the town to accept more state grant funds to acquire two parcels for the Assabet River Rail Trail. These parcels covered the ROW running from Rt. 117, through the woods, to White Pond Rd. This article was designed to allow the town to increase its borrowing over what was already authorized at Town Meeting in 1998. On Saturday October 5th, the ARRT participated in the annual Maynard Fest in downtown Maynard. Much improved weather this year, resulted in a good turnout. September 14, 2002: ARRT trail construction project open for bid! MassHighway has announced the contract for 4.7 miles of the ARRT trail in Marlborough and Hudson will be advertised for construction bids Saturday, September 14th. The project has an estimated cost of $2,700,000. The construction bids are scheduled to be opened on January 21, 2003. Construction should start in the Spring and last for 12 months. The ARRT would like to congratulate all the people who made this possible, including the ARRT volunteers, employees and elected officials in Hudson and Marlborough, MassHighway, our state legislators and EarthTech, the project's engineering firm. Maynard: In early September, the Town of Maynard completed the acquisition of the trail right-of-way (ROW) that was privately owned by Emerald Acres Landscaping. 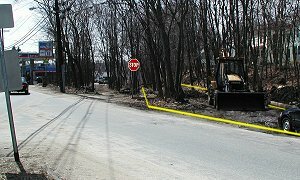 When combined with property acquired 20 years ago, the town now owns the entire 1000 feet of trail bed from Summer Street to Concord Street. This purchase also marks the first use of the trail acquisition funds that were allocated by the 1998 Maynard Town Meeting and 1997 state grants. The town will now move on to negotiations with several property owners on the south side of town. Stow: In August, the Stow Board of Selectmen appointed Don Rising as the town's designated member to the Assabet River Rail Trail Executive Committee. The 5 members of the ARRT Executive Committee represent each of the ARRT communities for trail planning and coordination between local governments. August 22, 2002: MassHighway conducted the public design hearing for "Section B" of the Marlborough-Hudson project. Section-B is the 2/3 mile section that runs from Main Street (RT-62) to Wilkins Street, at the eastern end of the town. 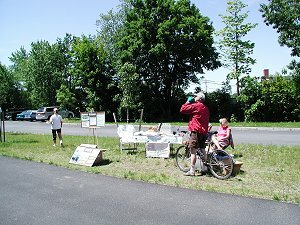 On Saturday June 8th, the ARRT sponsored an informal bike ride and fundraiser at the Nashua River Rail Trail. This brand new paved rail trail opened this spring in Ayer, and runs 8 miles north to Pepperell. The ride was a great success, with over 4 dozen ARRT T-shirts sold at the Ayer trailhead. Thanks to the volunteers who helped put this together. Especialy, Ed & Karen Wild, David & Daniel Marks, Carol Jonietz, Joey MacAloney and Duncan Power.